If you’re looking for an exhilarating rafting adventure, the best rafting in the country can be found right in the mountains of eastern Tennessee. The American Outdoors Association dubbed Tennessee’s Ocoee River the most popular whitewater rafting destination in the entire country. It’s no wonder it was selected as the location for the 1996 Olympic whitewater games. We can list a great number of reasons for the river’s popularity. While many whitewater rivers feature long stretches of calm water, the Ocoee features a steep, continuous grade and consistent rapids, meaning you won’t spend much time paddling. If you’re looking for constant fun, it’s hard to beat the Ocoee River. This river also guarantees a fun experience throughout the season. Whereas some rivers suffer from insufficient water flow during certain times of the year, this is not a problem with the Ocoee River. There is a dam upstream that controls the water flow, so there is always plenty of water for rafting. Because of the high quality of rafting in the region, many visitors choose to maximize the fun with a multi-day rafting trip. In this guide, we provide an overview of what to expect on overnight vs. single-day rafting trips, the accommodations available at Raft1 and useful tips for rafting with a group. By choosing a guided overnight rafting trip, you combine the thrills of rafting and camping into one vacation. It allows you to better connect both with nature and other members of your group. 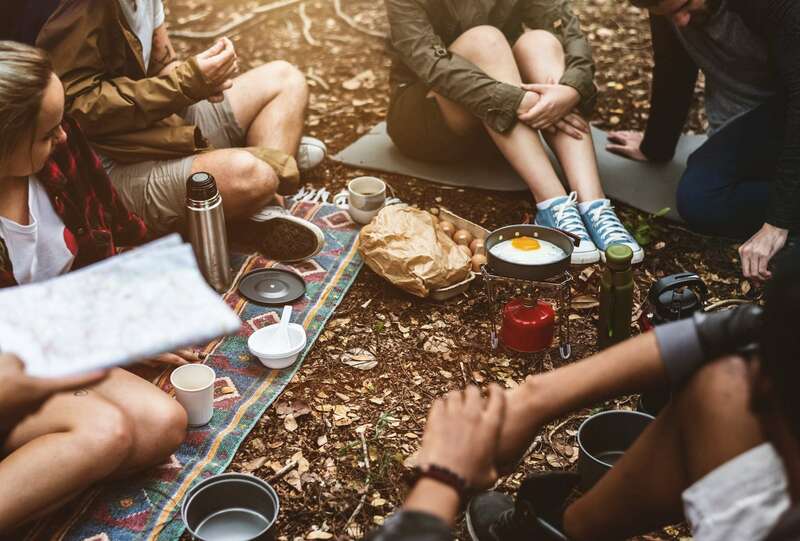 You spend the day rafting on the river — taking in gorgeous scenery and exhilarating whitewater — and in the evening, you can rest while your rafting guide makes a scrumptious meal by a cozy campfire. For many visitors, this camping is just as memorable as the rafting. If you’re an avid nature lover, you understand how great it feels to disconnect from the modern world and take in the serene natural environment. Just imagine that you are relaxing in a camp chair by the river waiting to eat a delicious fire-cooked meal. And in the morning, you wake up to the sound of the birds chirping and the river babbling. Improving your skills on the water: When you take a multi-day trip, you have time to practice what you learned the previous day and perfect some of the techniques your guide shows you. Mastering how to hold the paddle and get the best leverage in the water, for instance, becomes easier the more you do it. More time to bond with your fellow rafters: Many of the overnight trips we host include groups who want to forge closer bonds, whether it’s an office outing designed to foster teamwork or a church group getting to know one another for the first time. When you go overnight, the camping experience offers even more opportunity to make memories. Longer chance to unplug: So many of us these days want a chance to get away from the screens that dominate our lives when we’re in the “real world.” Maybe you need a break from your work inbox. Or perhaps you want your teenagers to ditch their phones and interact with the rest of the family. Whatever the reason, you can find many chances to unplug on a longer white water rafting trip. Greater chance for stress relief: Exercise provides an excellent way to channel your tension and get it all out. Being active keeps your mind engaged and your body strong. The longer you stay on the river, the more you’ll experience these benefits. You have younger rafters with you. Young people who have never been on a rafting trip will want to build their endurance slowly. You are looking for value. Although all our rafting trips offer great value, the lower cost of single-day rafting trips may fit your budget better. You want to take your adventure in a shorter timeframe. If you’re unable to get several consecutive days off, single-day rafting may be the best option available to you. At Raft1, many guests take advantage of our camping and lodging facilities before setting off on their rafting adventure. At Raft1, visitors have a choice between staying at our lodges or pitching a tent in one of our camping sites. Camping in tents is the ultimate outdoor experience, as a piece of nylon is the only thing separating you from the trees and sky. You fall asleep hearing the chirping of crickets and breathing the cool, fresh air of the wilderness. City dwellers often find it a refreshing change from the chaos of urban living. Camping is also an extremely affordable option, as our camping sites cost only $5 per person per night. If you and your group are interested in this experience, Raft1 has two sites with enough room for three or four small tents. They are located just up the hill from the men’s and women’s bathhouses. You cannot reserve these sites, as they are first-come, first-serve. Tents: Make sure to bring all necessary poles and stakes, and keep in mind that our campsites cannot hold tents larger than 10×10 feet. Tent footprints and tarps: Put these under the tent to cover the ground. Sleeping bags and sleeping pads: Place the pads underneath the sleeping bags for extra comfort. Pillows: They’re easy to forget and no fun to sleep without. Repair kit: Bring a kit that can repair your tent and pads. Firewood: You can purchase this at nearby stores. Water containers: Few things can ruin your fun like a bad dehydration headache. Extra blankets: It can get chilly at night, especially during the off-season. Garbage bags: Bring a few extra ones for damp clothing. Grills: We recommend small, portable grills that run on propane. Flashlights and extra batteries: Lanterns and headlamps are also good options. Fuel: If you’re using a lantern, make sure to bring along some lantern fuel as well. Matches: Dispose of them carefully after use. Towels: For drying off after you go rafting. Folding chairs: Bring one per person. If you want to make your own food, that will require you to bring a number of additional items. Before you leave home, it’s a good idea to plan what you want to eat for each meal. Then, to save time, prepare what you can before you leave your home. Cut the carrots, marinate the chicken and wrap the potatoes in foil. This will make things much easier once you get to the campsite. When you’re packing the cooler, organize the food meal by meal. Also think about how you want to serve the meals so that you’ll remember to bring the needed utensils and condiments. Unlike our campsites, our lodges provide you with the convenience of air conditioning and the protection of wooden walls. This may be preferable for those who have never camped before or have special sleeping needs. Staying at one of our lodges means that you won’t need to bring along as much stuff. The lodges include beds, so you won’t need a tent or air mattress. We have two Ocoee River lodging options. If you’re traveling with a large group — especially one with several dozen people — the Big Lodge is a great option. This spacious two-story lodge features four rooms that can house up to 44 guests in individual beds. Mattresses are included on the beds, and there is also a kitchen with a fridge and microwave. However, you will need to still bring along a pillow, sleeping bag and towels. There are two small bathrooms in the lodge, and to shower, you just need to go down the hill to the main bathhouse. The lodge’s air conditioning units may be a major draw if you’re visiting during the hottest months of the year. The lodge also features a large common room and spacious deck, which are great for hanging out or playing games. The deck also includes picnic tables and grills. How much is an overnight rafting trip stay at the Big Lodge? It is $15 per night per person, and a minimum payment of $250 must be made. As the name implies, this lodge is smaller, suitable for groups of 16 people or fewer. It has two rooms and a total of 16 bunk-style beds. Like the Big Lodge, mattresses are provided, but you will still need to bring a sleeping bag, pillow and towels. The Small Lodge has a kitchenette with a refrigerator, microwave and sink, but no stove. This lodge also includes air conditioning and two small bathrooms, and the showers are a short walk away in the main bathhouse. Connected to the Small Lodge is a spacious screened-in porch. Multi-day rafting trip pricing for the Small Lodge is $15 per night per person. A minimum payment of $75 is required. If you desire more luxurious accommodations during your overnight white water rafting trips in Tennessee, you can look into nearby cabin rentals, which are quite affordable and offer all the comforts of home. Many of you will be bringing others along on your rafting trip, which we encourage. After all, white water rafting is a great opportunity for coworkers and members of other groups to bond. 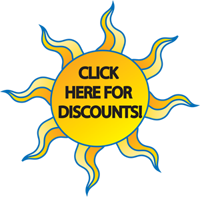 And in addition to enriching your travel experience, bringing others along may earn you discounts. However, we understand that traveling with a large group of people can also make things more complicated. For this reason, we’ve compiled a few tips for choosing an overnight rafting trip in Tennessee and facilitating group participation. Although anyone over 12 years of age can join our rafting excursions on the Ocoee River, it is a challenging activity. While we help as many people as possible to enjoy it, this activity is not for everyone. When booking a rafting trip, present every person with the rafting options available and make sure they know the difficulty of each choice. You don’t want to be responsible for booking a trip that some members of the group can’t handle. Class I: These rapids are considered the easiest to handle and feature slow-moving water and light waves. Class II: These rapids are characterized by moderately fast-moving water and regular waves. There is space to maneuver through rocks and other obstacles. Class III: Class III rapids are considered moderately difficult and have higher waves and some faster-moving water. There is less space to move between obstacles. Class IV: Class IV rapids are considered difficult and feature powerful rapids and quickly flowing water. Some advanced paddling is required, and there may be sections of rapids that require some advance scouting. Class V: Rapids of this class are long and extremely difficult. They also feature steep drops. Class VI: These rapids are extraordinarily difficult and should only be tackled by experts. The best group rafting trips take into account everyone’s skill level. At Raft1, the Middle Ocoee option has rapids ranging from Class I to IV, whereas the Upper Ocoee features Class V rapids. Contact Raft1 and check a few tentative dates for overnight white water rafting trips. This can be a huge time-saver. Some dates get booked up several months ahead, so find out a few available times others in your group can choose from. Don’t rely on spoken commitments. Print out a sign-up sheet from Raft1 and have them sign it. Make sure the sheet has all the important information on it, including the date and time of the trip, where to go for more information, Raft1’s website and when the deadline is for both the deposit and full payment. Send a confirmation email. Write and send out an email to everyone who signed up that includes the deadlines for the deposits, full payments and waivers. Also, add a link to Raft1’s Rafting Group Information packet. Have everyone sign the waivers. Get everyone to fill out the waiver form before the day of the trip. Have everyone pay the deposit. This will guarantee their spot. Inform everyone of the full payment deadline. Remind them frequently that they must pay in full by the two-week deadline. If you’re going with a larger group, chances are you will arrive in separate vehicles for multi-day white water rafting trips. Make sure everyone knows to arrive a half hour before the scheduled departure. This will give them enough time for checking in, getting dressed, signing waivers and meeting the guides. Also note that the Raft1 Rafting Outpost is in the Eastern time zone, so if some people in your group are coming from places in the Central time zone, such as Nashville, then they should remember our clocks are one hour later. At Raft1, we are committed to bringing you exciting overnight Ocoee river rafting trips led by friendly and experienced guides. Check out our accommodations and rafting adventures. We offer lodging options that are affordable and rafting adventures suitable for all skill levels. If you’re a beginner interested in an overnight excursion, we provide one of the best multi-day rafting trips for first-timers. 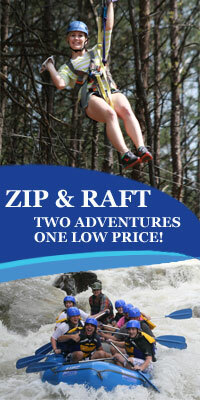 Raft1 also offers zipline adventures, mountain biking excursions and horseback riding opportunities. If you have any questions about our activities, rates or discounts, contact us online or call 1-888-RAFT-ONE (888-723-8663).